I have one. I make sure my employees have one. And I try to encourage all employees to have one, not just managers. The idea is often met with resistance. I hear things like “I’m developing all the time, why do I need to write it down?”, or “I don’t have time to do that”, or “That’s just some form HR makes us fill out… it’s worthless”, and on and on. There’s some truth to all of these comments. Perhaps at one time you were forced to fill out a form, or maybe someone even wrote one for you. Maybe it was the last page of a performance appraisal. There was little substance, little buy-in, and it really was just extra work that no one has time for. When I conduct workshops on how to develop as a leader, or am coaching a leader, I usually get pretty good buy-in until we get to the point where it’s time to put it in writing. The moment of truth, time to make a commitment. Then, for some, picking up that pen is met with staunch resistance. I heard a story that convinced me of the power of having written goals that I often tell to try to get people over this hump. It turns out I’ve had a few of the facts wrong, but it’s been close enough to often make the point and change some minds. In the book What They Don't Teach You in the Harvard Business School, Mark McCormack tells a study conducted on students in the 1979 Harvard MBA program. In that year, the students were asked, "Have you set clear, written goals for your future and made plans to accomplish them?" Only three percent of the graduates had written goals and plans; 13 percent had goals, but they were not in writing; and a whopping 84 percent had no specific goals at all. While this story is about financial goals, the same concept applies to leadership development goals. You can sit back and float though life hoping you’ll get better as a leader. And if you’re lucky, you will. Development will come to us. But why not increase your chances of success ten times simply by putting your development goals in writing? Do it. It’s the best investment you’ll ever make. Great post, Dan. I am fortunate to be in a department that does facilitate development, but with me in the driver seat. I am one of those people who has a hard time writing down goals (I'm lucky if all my meetings make it into my planner some days), but I have learned that writing it down (and keeping up with it), is key to keeping focused. Interestingly, my company is changing the way our performance management system tracks this in that Managers' reviews will include whether their team achieved their training goals/requirements in our internal University program. Thanks for another helpful post. Your blog is always teaching me something. Thanks. Right, most of the new talent management systems now make it easier to track goals, as well as integrate development planning with performance management and succession planning. Dan, great post on the importance of written, individual development plans. This topic earned a good portion of a chapter in my 2007 book and is something that I coach and teach in workshops. 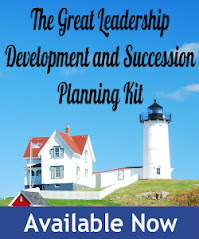 I ask participants to complete brief surveys to assess the Leadership Culture of their working environment, and in two years and hundreds of surveys, just over 80% of respondents indicate that they DO NOT have a written individual development plan. It comes as no surprise that these same individuals do not work with their direct reports to create individual development plans either. I do hear a lot of half-hearted excuses, ranging from “no time” to various ways to throw HR under the bus. Others dismiss the importance and emphasize their personal conversations and/or development objectives highlighted on performance reviews as adequate. In my opinion, the most valuable part of developing an individual development plan as a collaborative activity between manager and supervisor comes in identifying specific assignments where an individual can gain experience in the area that they are interested in pursuing. This creates powerful learning experiences for all parties involved. This has proven particularly helpful to me in the work environment where an individual has decided that leadership is their next step. I’ve had more than a few individuals who were given informal leadership assignments recognize that this was not right for them and focus on building their skills as an individual contributor. Thanks. Sounds like you and I are on the same "page" (sorry, a very lame pun) when it comes to IDPs. Then, for some, picking up that pen is met with staunch resistance. Thereby revealing that they might not be leadership material after all. Once you put something in writing it becomes more concrete and tangible than what we keep in our heads. Putting your development plan in writing makes it easier to stick to and succeed at. Thanks for sharing the Harvard Business School story, really opens your eyes to the power of putting your goals in writing. Great post! alsways good to hear the wisdom of a bloghound. I completely agree with you Dan. people who has clear goals, commitment to convert them into a IDP and follow plan on on-going basis with necessary dynamics is lot better chance (or I would say maximum)chance to achieve their goals. For me, having a written goal and plan to achieve them keep reminding about challenges or development area which is needed to see successfully achieveing my goals. So I am fully agreed and understand Power of written clear IDP plan and sure this would guide me to get success I am looking in my personal and professional life.